Aggregation and other conformational changes of protein molecules caused due to interactions with silicone particles can render the drug ineffective. Immunogenic responses in patients caused by injection of silicone oil induced protein aggregates or silicone oil/protein complexes. Any of the problems above can bring a pre-filled device project to a screeching halt or lead to a recall – both are expensive and risky scenarios no R&D leader wants to deal with. In the case of diabetes pump devices that require multiple bolus doses by end users, particle risk is further compounded by the fact that silicone oil causes a forces problem. 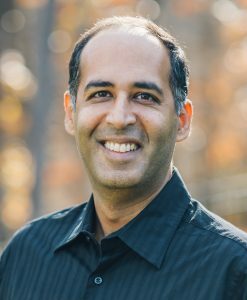 THE PARTICLE PROBLEM LED TO TWO PATENTED INVENTIONS FOR TRIBOFILM. TriboFilm Research got its start when a pharmaceutical company approached us and asked us to solve their ‘particle’ problem. Our journey began in their frustration with silicone oil and ended a decade later, with our two patented technologies – TriboGlide-DS® and TriboLink-Si®. The key difference between TriboGlide-DS® and TriboLink-Si® is that one is completely silicone-free and the other one uses silicone – but in a way that reduces particles. We customize and adapt these technologies based on each client’s unique needs, then transfer the intellectual property using a simple licensing model. During their pre-clinical trial studies, one pharmaceutical company found protein/silicone oil aggregates in their prefilled syringe. The company already had a production line commissioned, built, and qualified at their contract manufacturer’s facility. This protein/silicone oil aggregate posed a significant risk for the product moving forward. With huge investments of money and time in the product development, the silicone-oil syringe lubrication stopped the entire launch in its tracks. TriboFilm Research was brought in to see if TriboLink-Si® technology could solve the silicone oil contamination issue. Our team demonstrated that downstream plasma crosslinking of the silicone oil could reduce the particle burden by more than 85%. This technique required minimal changes to the production line and no changes to any of the syringe components which kept all of the quality systems intact. With minor changes, the project was back on track for clinical trials and product launch. TriboFilm realized that replacing silicone oil with another liquid would not be the solution. Instead, our team wondered: what if we designed a lubricant that attaches to the surfaces of the prefilled device? This research (partially funded by the National Institutes of Health through an innovation grant) culminated in a patented Downstream Atmospheric Plasma Technology that crosslinks and immobilizes a lubricant onto a pharmaceutical container. Immobilizing the lubricant reduces the tendency of the lubricant to displace from the syringe barrel and into the drug product, which results in fewer sub-visible particles. Since we work exclusively under Non-Compete Agreements, most of our client data cannot be shared here. However, the results below will give you a sense for the stark improvements our two flagship technologies (TriboGlide-DS® and TriboLink-Si®) offer versus silicone oil and baked-on silicone. Each application is different, and in order to evaluate if TriboFilm’s technologies are right for your device, we must test your specific container. 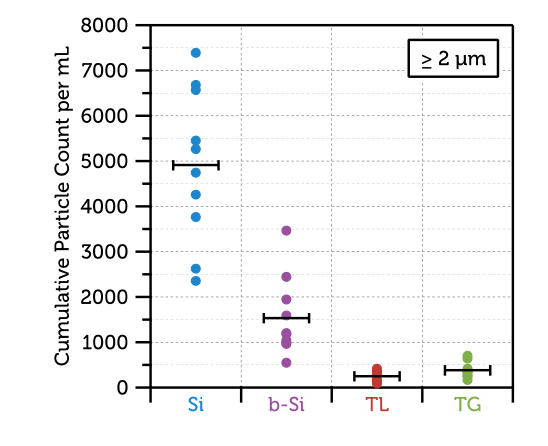 Particle counts for 1 mL long glass syringes lubricated with silicone oil (Si), baked-on silicone (b-Si), TriboLink-Si® (TL), and TriboGlide-DS® (TG). All samples were filled with a 0.05% Polysorbate 80 solution in sterile filtered water, stored for 12 weeks at 40°C, and agitated for 24 hours just prior to characterization. The black horizontal bars represent the average value of each series. 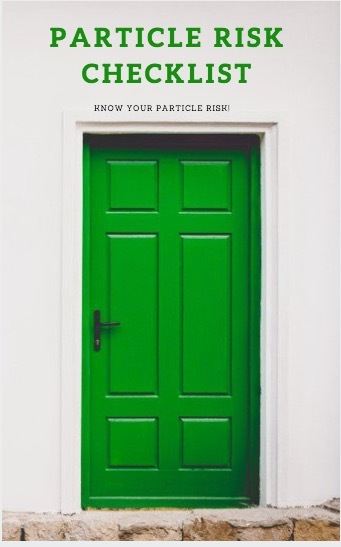 As you can see, TriboLink-Si® (in the red) and TriboGlide-DS® (in the green) have the lowest cumulative particle count per mL. 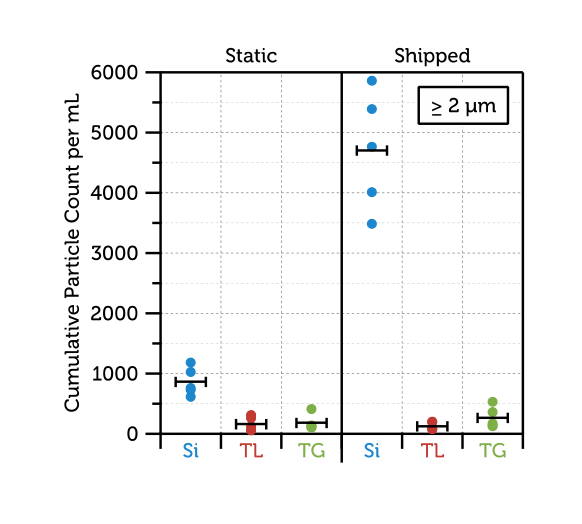 Particle counts for 1 mL long glass syringes lubricated with silicone oil (Si), TriboLink-Si® (TL), and TriboGlide-DS® (TG). All samples were filled with a 4 mg/mL solution of rHSA in pH 7.2 phosphate buffer. Half of each set of ten samples (shown on right) were overnight shipped by air ~2500 km. All samples were stored for 4 weeks at 25°C. The black horizontal bars represent the average value of each series. If your product is shipped, this is a very important data set because as you can see, silicone oil poses a lot of problems when it is subjected to agitation during shipping. Both TriboLink-Si® and TriboGlide-DS® fare extremely well in agitation tests. To learn more about how we simulate agitation tests, Download TriboFilm’s Agitation Protocol here! Upon your request, we can perform these tests for you. Simply contact us and we will respond quickly to schedule a time to discuss your project. There is no charge for this initial consultation. It is simply a quick way for us to understand your needs and see if there is a fit. – Robert A. Mineo, BSAE, JD. 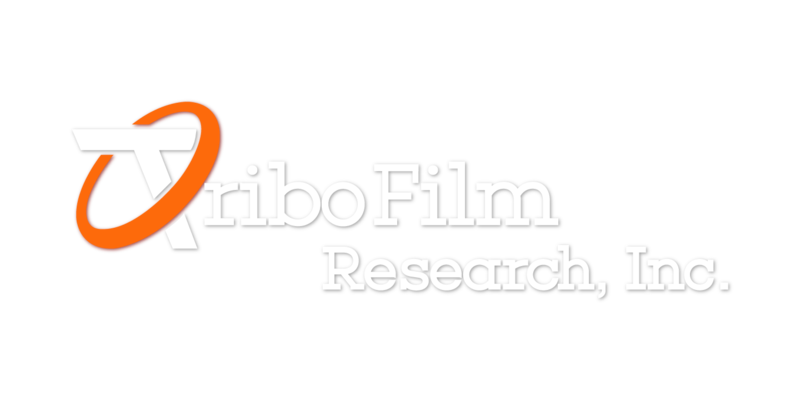 – Vice-President Legal and IP, TriboFilm Research Inc.
We are always happy to share our knowledge with others in the industry, whether you require our technology or not.